To Die Like a Man is a exploration of gender identity, desire and aging, set around the back drop of Lisbon's 1980s drag scene. Film will be screened in 35mm print. 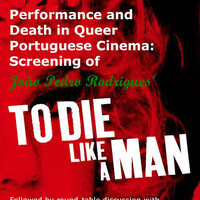 Screening will be followed by a round-table discussion with the internationally-acclaimed filmmaker, Joao Pedro Rodrigues, and USC scholars Laura Serna (USC School of Cinematic Arts), Emerson Whitney (USC Gender and Sexuality Studies), and Camila Moreiras (USC Latin American and Iberian Cultures). The event will take place at the Downtown Independent (a short metro ride from USC) on Monday, April 15, from 11 am to 2 pm. The event is free and open to the public. This event is co-sponsored by the USC Division of Cinema and Media Studies, USC School of Cinematics Arts, USC Visual Studies Research Institute, USC Gender and Sexuality Studies, USC ONE Archive, USC Comparative Literature, USC Comparative Studies in Literature and Culture Doctoral Program, USC Latin American and Iberian Cultures, USC Dornsife Dean, Strand Releasing, UCLA Film and Television Archive, and the Downtown Independent.